To date, we have authored nine railroad route guidebooks covering the various Midwestern passenger railroad routes out of Chicago. Our popular "Outside the Rails" book series now serves as a major fund raiser for the American Passenger Rail Heritage Foundation's Rail Rangers program, which provides free on board educational programs on private rail excursions in the Upper Midwest region. The goal of writing the route guidebooks is to educate passengers about what they are seeing out their window - from history to geology and general facts. We think that both big rail enthusiasts and those who are just taking a leisurely ride on the line will appreciate the knowledge shared in our books. Our most recent edition, "Outside the Rails: A Rail Route Guide from Chicago to Carbondale, IL" was released just a few months ago and is now available for purchase for just $20. The history of the train line between Chicago and Carbondale can be traced all the way back to the 1830’s. The Illinois General Assembly made several unsuccessful attempts during that decade to charter a railroad linking the northern and southern parts of the state. It was not until 1850 that President Millard Fillmore signed a land grant for the construction of the railroad, making the Illinois Central the first land-grant railroad in the country. The Illinois Central was charted by the General Assembly on February 10, 1851 to build a railroad line between Cairo (located on the Ohio River) and Galena (in far northwestern Illinois), with a branch line that would extend between Centralia and Chicago. Senator Stephen Douglas, and later, President Abraham Lincoln were both Illinois Central men who lobbied for it. Douglas owned lands near the terminal in Chicago and Lincoln was a lawyer for the railroad. Construction took about five years; when the line was complete in 1856, goods from Chicago had a new route down to New Orleans – via train to Cairo and then on a railroad-operated steamboat line. In Chicago, the Illinois Central tracks were laid along the shore of Lake Michigan and on an offshore causeway downtown, but land-filling and natural deposition has moved the present day shore to the east. 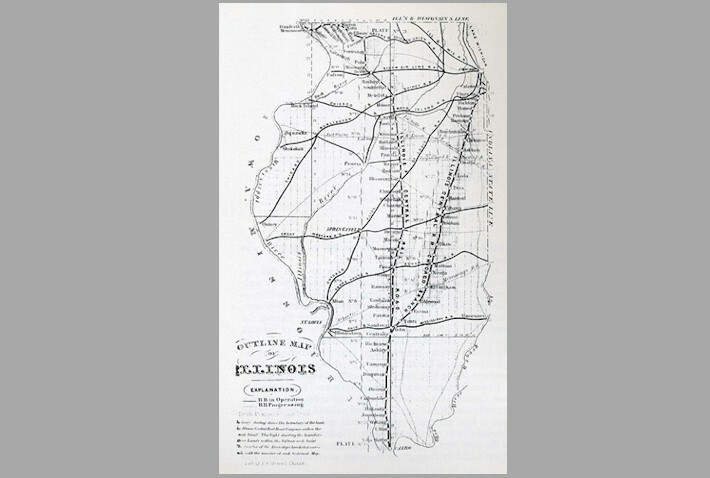 By examining the above 1856 railroad map of the Illinois, you see the original Illinois Central ‘Chicago Branch’ to Centralia is the same line that Canadian National/Amtrak trains operate on today, passing through communities such as Monee, Rantoul, Urbana, Mattoon, and Effingham. Likewise, the Illinois Central ‘Old Main Line’ between Centralia and Carbondale is the same railroad line that trains operate on today, passing through communities such as Ashley and DuQuoin. 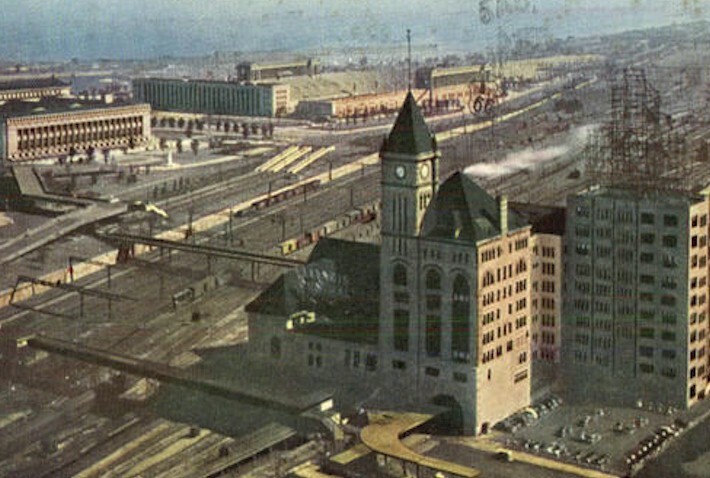 On June 21, 1856, the Illinois Central began operating out of Great Central Station; for a period of time it was the largest building in all of Downtown Chicago. It was located at the intersection of what is now Michigan Avenue and South Water Street. Even though it was damaged in the Great Chicago Fire of 1871, Great Central Station continued to serve Illinois Central passengers for many more years. The American Civil War broke out just five years after the completion of the railroad line between Chicago and Carbondale. Historians agree that the Illinois Central played a pivotal role in funneling Federal troops and supplies southward to open the Mississippi River to the Gulf. After the war, many famous generals and civil engineers from both sides served in positions of leadership with the Illinois Central. 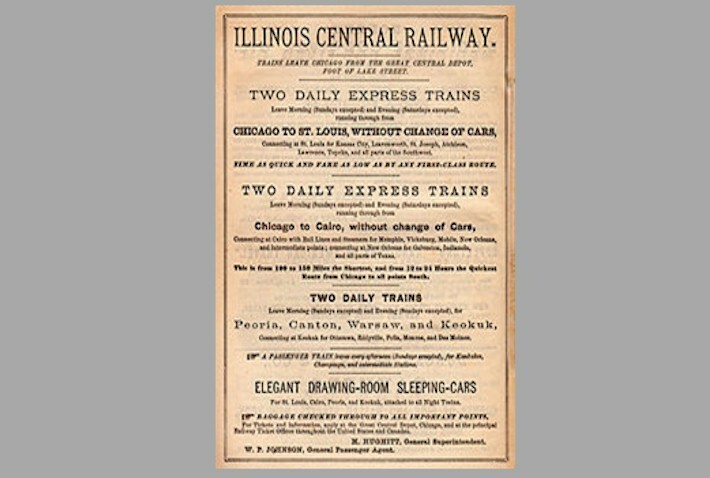 The years following the Civil War saw a lot of growth for the Illinois Central. Company leaders realized that it was necessary to extend its rails beyond Cairo and the Ohio River – all the way south to the Gulf of Mexico. To accomplish this, the Illinois Central constructed a railroad line between Cairo and Jackson, Tennessee in 1873. It then formed partnerships with other railroads in Mississippi down to New Orleans. During the 1880’s, the Illinois Central expanded its lines northwest through Wisconsin, Iowa, Nebraska, and South Dakota. The Illinois Central constructed a new facility in Downtown Chicago, Central Station, to meet the travel demands of the World’s Columbian Exhibition of 1893. It was located at the south end of Grant Park, near present-day Roosevelt Road and Michigan Avenue. Illinois Central’s long distance passenger trains would terminate here, while commuter trains continued to stop north of Central Station, around where the present-day Millennium Station is located. In 1900, a minor train wreck along the line at Vaughn, Mississippi achieved worldwide fame for the Illinois Central when an engine-wiper named Wallace Sanders wrote a song about the incident. The engineer, the only person killed, was named John Luther Jones, of course he was better known by his nickname “Casey”. The Illinois Central continued its expansion and improvements in the early 20th Century. In 1926, the railroad electrified its suburban line along the Chicago lake front. 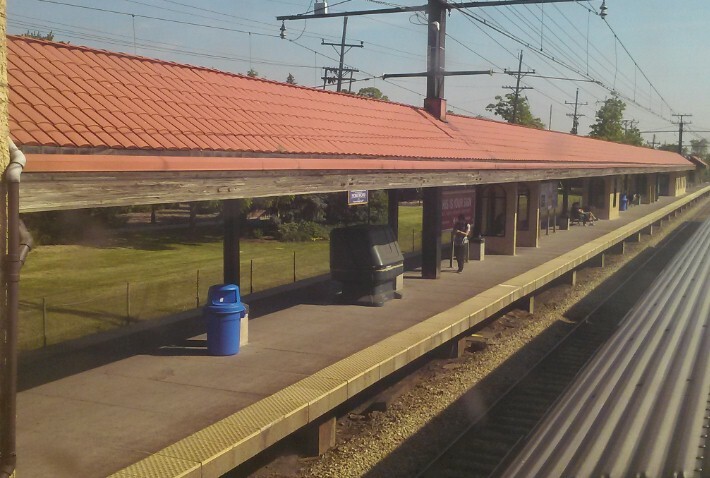 The suburban or ‘commuter line’ tracks were separated from the tracks used by mainline passenger and freight trains. This remains the case today, and can be seen as we travel between McCormick Place in Chicago and south suburban University Park. For many years, the Illinois Central was a major carrier of passengers on its line from Chicago to Carbondale, and beyond. The Panama Limited passenger train operated from 1911 to 1971 by the Illinois Central between Chicago and New Orleans via Carbondale. The train took its name from the Panama Canal, which was then three years from completion. For most of its life, the train was “all-Pullman”, carrying sleeping cars only. The train even included a Saint Louis section that connected with the Chicago section at Carbondale. The Illinois Central Railroad introduced the original City of New Orleans on April 27, 1947 as a Chicago to New Orleans (via Carbondale) daytime companion to the overnight Panama Limited. This train also exchanged St. Louis-New Orleans through cars at Carbondale, and Louisville-New Orleans through cars at Fulton, Kentucky. This train was immortalized in a folk song written by Steve Goodman in the 1970’s. 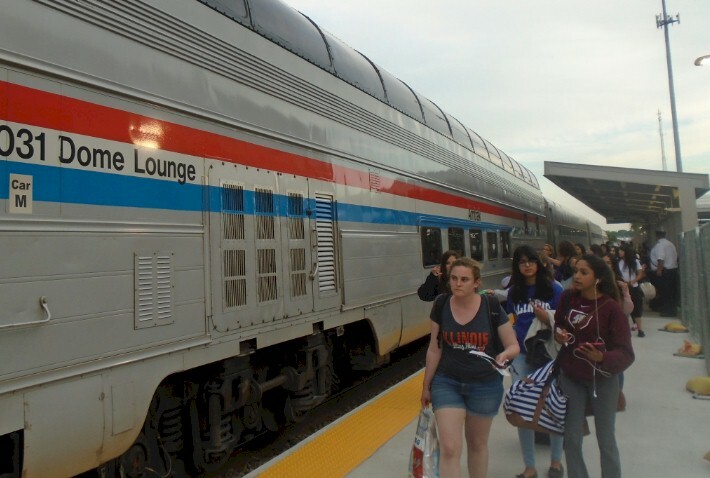 In 1971, Amtrak took over the operations of all Illinois Central passenger trains, except for its commuter operations in the Chicagoland area (which later became part of Metra’s system). 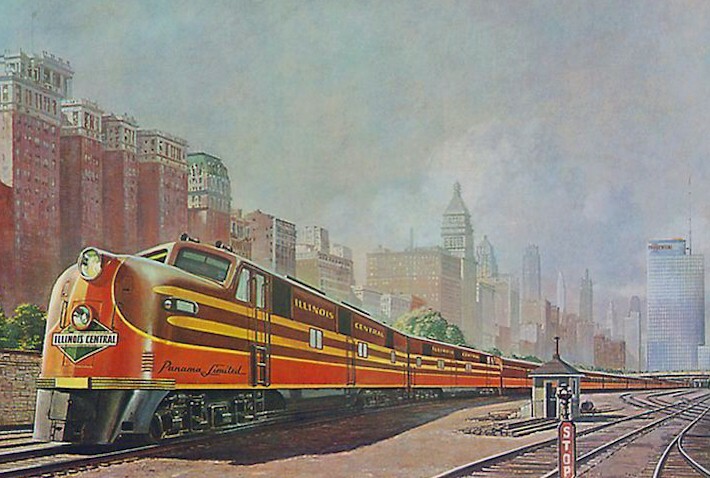 Amtrak operated the Panama Limited, later re-named City of New Orleans, and regional train Shawnee to Carbondale. Also, terminal operations were moved to Union Station in 1972; Central Station was demolished in 1974. In August 1972, the Illinois Central merged with the Gulf, Mobile and Ohio Railroad to form the Illinois Central Gulf Railroad. During the 1980’s, ICG spun off most of its east-west lines and many of its redundant north-south lines, including many former GM&O lines like its historic route between Chicago and Saint Louis. Through this consolidation period, the ICG retained control of the train line between Chicago and Carbondale. In February 1988, the then-parent company of ICG changed names, leading to the railroad reverting back to its original Illinois Central moniker. On February 11, 1998, the Illinois Central was purchased by Canadian National Railway, the current owner of the rail line between Chicago and Carbondale. Integration of operations began on July 1, 1999. 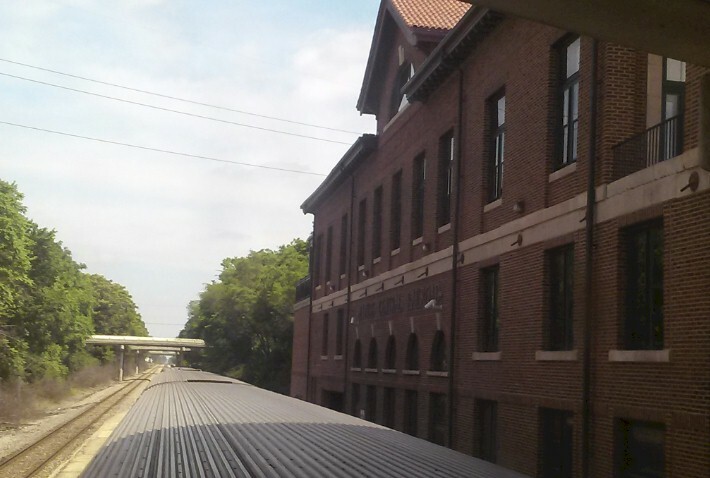 The first station stop for southbound trains is Homewood; this station is shared with Metra Electric service trains. 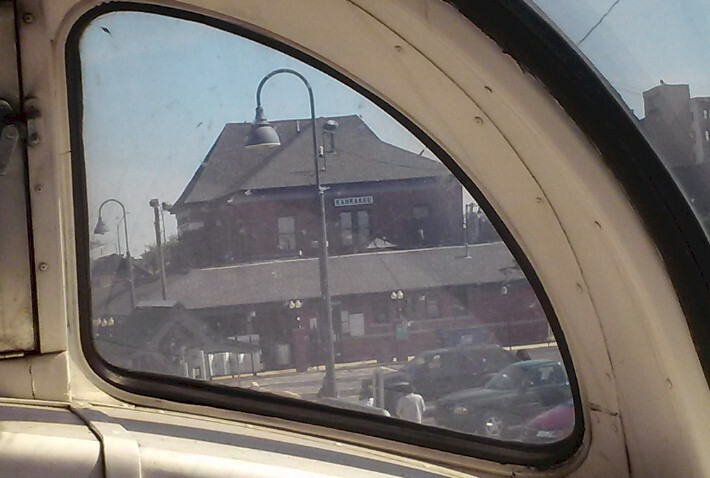 The Kankakee station, as seen out the window of the dome car "Ocean View"
College students from the University of Illinois prepare to board the train at the Champaign, Illinois train station. 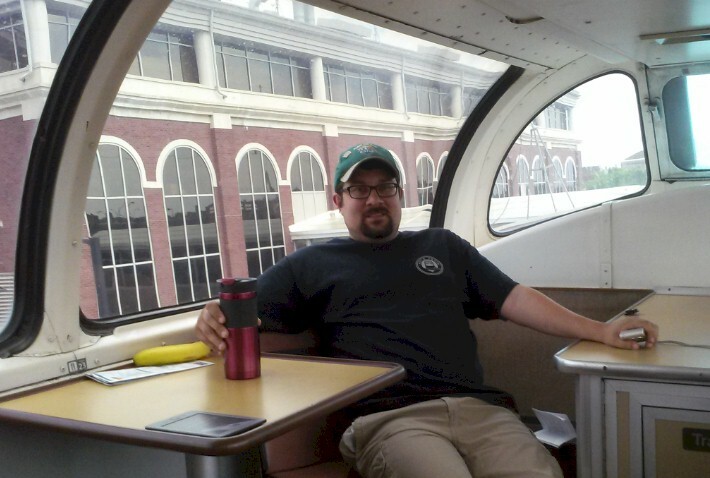 Note Amtrak's last remaining dome car "Ocean View" was operating on our train this day. 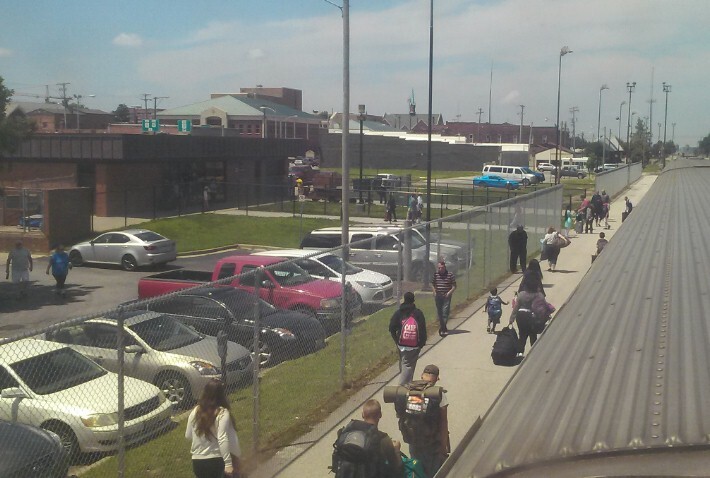 The end of the line for the Saluki, the passenger train station in Carbondale, Illinois. 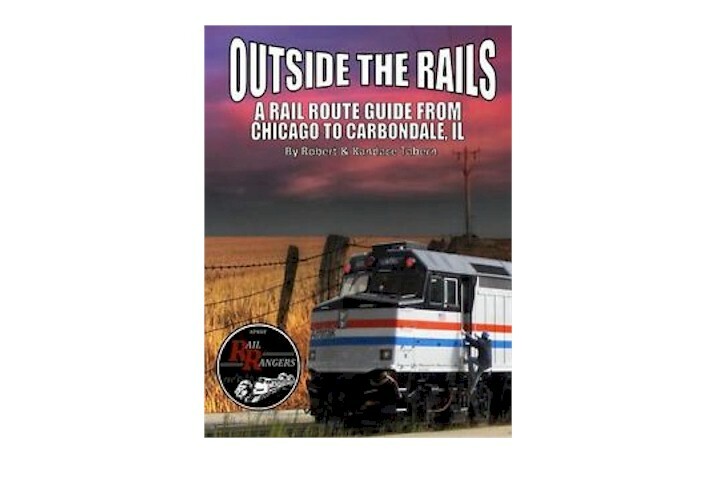 If you are interesting in purchasing a copy of "Outside the Rails: A Rail Route Guide from Chicago to Carbondale, IL", or any of our other eight rail route guidebooks, you can head over to our website at www.railbook.org. We appreciate your support and know that you will treasure our milepost-by-milepost guide for this route through Illinois' breadbasket. We are currently working on writing two new editions of "Outside the Rails" that will be released later this summer. 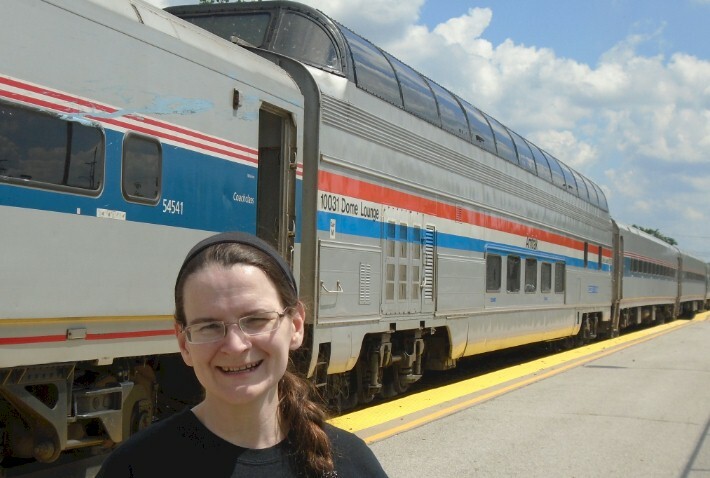 This includes a route guidebook from Chicago to Detroit/Pontiac, Michigan for the Amtrak line and from Chicago to South Bend Airport, Indiana on the South Shore Line. We will also write a preview for each book in the coming months here on TrainWeb. We are taking pre-orders for these books now, with an expected release date between mid-July 2017 and early August 2017.